Twellose Gele is a historically known regional variety and forms attractive yellow-green heads. 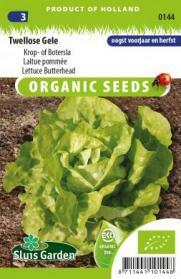 An excellent butterhead lettuce, which produces soft, tender heads. Highly suitable for early cultivation. Grows quickly and has good resistance to the cold. Sow in early spring and late summer/autumn. Keep seeds cool in the summer. Thin out liberally and keep sufficiently moist during warm weather. Lettuce can already be sown at low temperatures (> 10°C).